A Colorado woman was arrested on Thursday for an unusual crime: groping a TSA agent. Now a grassroots movement is rallying behind her. 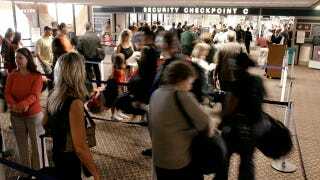 According to Kansas CW, 61-year-old Yukari Mihamae was going through security at the Phoenix airport when she got into a disagreement with a female agent. Then she allegedly "squeezed and twisted the agent's breast with both hands." Police said she confessed, but she apparently later denied the groping, telling the New York Post only, "I go through this every week, and every week there is some problem." Presumably she meant she goes through security, not accusations of assault. Of course, it's possible to protest TSA regulations without abusing someone who's trying to carry them out. The agent in question likely didn't have any authority over how regulations were applied, and groping somebody isn't a great way to show that groping is wrong. If Mihamae really wanted to protest against TSA screenings, she could have found a number of ways to do it without victimizing another woman. And if Americans fed up with TSA procedures want a hero, they should pick somebody who hasn't been arrested for assault.